Does Washington issue concealed carry permits? Yes, Washington is a shall issue state, meaning the state is required to furnish a permit if you can pass a background check. Washington issues concealed carry permits to residents of the state as well as non-residents. All fees for non-residents are the same but the waiting period is extended to 60 days. What does a Washington concealed weapon permit look like? Who issues Washington concealed weapon permits? Are background checks required for a Washington Concealed Weapon Permit? Background checks are requred when applying for a Washington concealed carry permit but it does not qualify as a NICS check. How long is a Washington concealed weapon permit valid for? Washington concealed weapon permits shall be valid throughout the state for a period of five (5) years from the date of issuance. What is the processing time for a Washington concealed weapon permit? 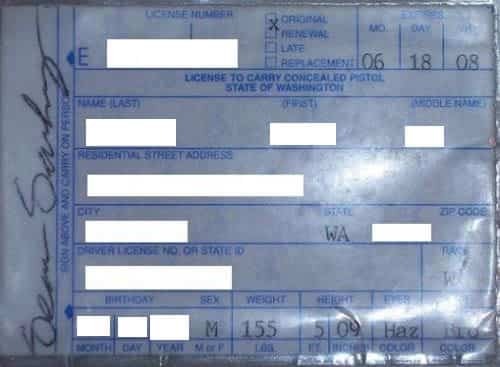 Washington concealed weapon permits are processed in approximately 30 days for those possessing a Washington driver’s license and 90 days without one. How much does a Washington concealed weapon permit cost? The fee for a Washington concealed weapon permit is $36.00 plus fingerprinting cost so the total cost may vary. What are the requirements for a Washington concealed weapon permit? Be 21 years of age or older at time of application. Have no pending trial, appeal, or sentencing on a charge that would prohibit you from having a license. Have no outstanding warrants for any charge, from any court. Have no court order or injunction against possessing a firearm. Have no mental health conditions that would prohibit you from having a license. Have no felony convictions, or adjudications for a felony offense, in this state or elsewhere. “Felony” means any felony offense under the laws of Washington, or any federal or out-of-state offense comparable to a felony offense under the laws of Washington. What are the required documents when applying for a Washington concealed weapon permit? Picture identification such as a Washington State driver license or identification card. If you don’t have a Washington State driver license or identification card, you must provide proof you have lived in the state for at least the last 90 days. The $55.25 fee in cash, check, or money order made payable to the law enforcement agency. This fee is non-refundable. If you’re in the military, your military ID and orders listing your station location. If you live in the unincorporated area of a county apply at your sheriff’s office. If you live in an incorporated city within the county, apply at either the city police department or sheriff’s office. If you aren’t a Washington State resident, apply at any local law enforcement agency in Washington. How do I renew my Washington concealed weapon permit and what is the cost? Where do I renew my Washington concealed weapon permit? If you live in a city, apply at your local police department or the county sheriff. If you live in an unincorporated area of the county, apply at the county sheriff. What do I need to bring when I renew my Washington concealed weapon permit? Picture identification such as a Washington driver license or identification card. Your current concealed pistol license. How do I change my name or address on my Washington concealed weapon permit? Go to the law enforcement agency where you currently live. Complete an application, marking the “Replacement” box. Submit the application with the replacement fee. What do I do if my Washington concealed weapon permit is lost or stolen? If your license has been lost, stolen or destroyed, you may obtain a replacement concealed pistol license from your local law enforcement agency. You will need to apply in person and the fee for a replacement license is $10. Do I need to inform law enforcement that I am carrying a concealed weapon? You are not statutorily required to inform law enforcement you are carrying a weapon in the state of Washington, but you must present your permit if requested. What are the laws regarding a firearm in an automobile in Washington? Without a Washington concealed weapon permit, your firearm must be unloaded. If you leave the firearm in your vehicle the vehicle must be locked and the pistol must be out of view. What places are off-limits when carrying a concealed weapon in Washington? (b) Those areas in any building which are used in connection with court proceedings, including courtrooms, jury rooms, judge’s chambers, offices and areas used to conduct court business, waiting areas, and corridors adjacent to areas used in connection with court proceedings. The restricted areas do not include common areas of ingress and egress to the building that is used in connection with court proceedings, when it is possible to protect court areas without restricting ingress and egress to the building. The restricted areas shall be the minimum necessary to fulfill the objective of this subsection (1)(b). In addition, the local legislative authority shall provide either a stationary locked box sufficient in size for pistols and key to a weapon owner for weapon storage, or shall designate an official to receive weapons for safekeeping, during the owner’s visit to restricted areas of the building. The locked box or designated official shall be located within the same building used in connection with court proceedings. The local legislative authority shall be liable for any negligence causing damage to or loss of a weapon either placed in a locked box or left with an official during the owner’s visit to restricted areas of the building. EXCEPTION: this section does not apply to any administrator or employee of the facility or to any person who, upon entering the place or facility, directly and promptly proceeds to the administrator of the facility or the administrator’s designee and obtains written permission to possess the firearm while on the premises. EXCEPTIONS: proprietor of the premises or his or her employees while engaged in their employment. What are the laws regarding alcohol and a concealed weapon in Washington? In Washington, you may carry a concealed firearm in a restaurant that serves alcohol but not in the portion of the facility licensed for that purpose by the state liquor board.Does Washington has a Stand Your Ground law aka Castle Doctrine? Technically no. The law allows use of deadly force in the lawful defense of oneself, a family member, or any other person, when there is reasonable ground to prevent action(s) of the person slain to commit a felony or to do injury or harm, and there is imminent danger of such design being accomplished; or in the actual resistance of an attempt to commit a felony upon the slayer, on those in their presence, or upon or in a dwelling, or other place of abode, in which they are. 137 Wn.2d 533 State of Washington v. Studd; Decided 1999/04/01. 150 Wn.2d 489 State of Washington v. Reynaldo Redmond; Decided 2003/12/06.Does Washington state have localities with varying laws? Localities can enact prohibitions with regard to judicial areas but otherwise are limited.What are the laws regarding open carry in Washington? Open carry in Washington is not restricted by state law (other than those places listed above where concealed carry is prohibited). It is strongly recommended that you avoid any appearance of threatening someone i.e. handling your gun idling, etc as this could result in arrest and prosecution. To view a state’s concealed carry permit information click on the state. The state’s color represents whether a state is Shall Issue, May Issue, Constitutional Carry or Right Denied (We explain each state’s status here). We keep the information on this page as up to date as possible, but due to changing laws it is your responsibility to verify all information. The information on this page is for informational purposes only and not for the purpose of providing legal advice. You should contact your attorney to obtain advice concerning any particular issue or problem. Use of and access to this Website, emails or any of the links contained within the site do not create an attorney-client relationship between i156 LLC and the user or browser. The opinions expressed at or through this site are the opinions of the individual author and may not reflect the opinions of i156 LLC.